Bluefin often hunt in packs and form a high-speed parabola to concentrate prey and make it easier for the hunters to close in. The concentrated fish will often form a "bait ball" which the tuna surround and then eat at will. These "bait balls" often attract other organisms including dolphins and diving birds which take advantage of the concentrated food source. Bluefin are adapted for high-speed chases, but will take advantage of whatever they are presented with. Follow this link to view the Bluefin in action. 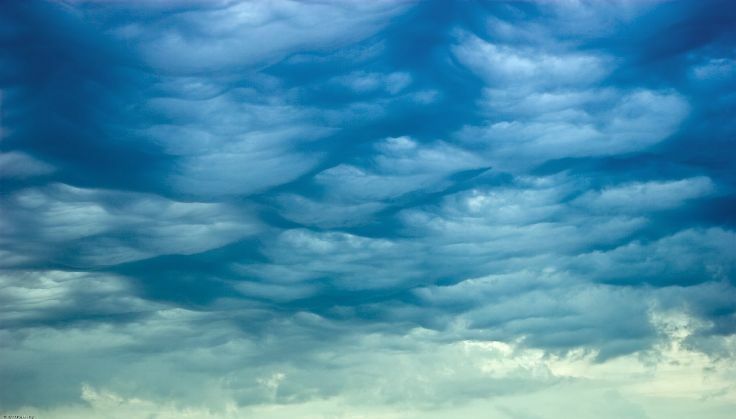 Photo courtesy of the NOAA . 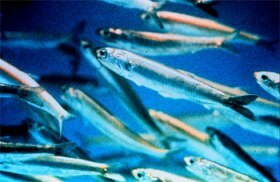 Bluefin larvae feed on small organisms such as brine shrimp and other fish larvae. The juveniles will also eat smaller organisms until they are large enough to feed on other small fish. 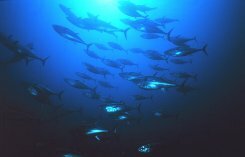 Bluefin adults are opportunistic eaters that will eat just about anything they run in to including kelp, sponges, squid, starfish, crustaceans, octopus, sea horses, anchovies, cod and other various fish. A study of the stomach contents of Atlantic Bluefin off the coast of New England found that the most popular food item was Atlantic herring, but again there was a wide variety of other prey items in the stomach as well. Photo courtesy of the NOAA.